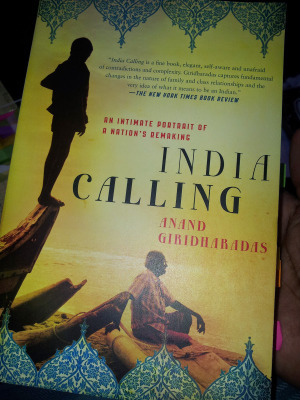 Anand Giridharadas’s India Calling is sort of my first foray into readings based on Indian culture, and the country in general. It’s an “intimate portrait” written by Giridharadas regarding his experience as an American-born Indian returning to the country his parents immigrated from before his birth (as well as his sister‘s). He exams the many influences as to why his parents left India, between a somewhat stifling culture and a tumbling economy. And then he relays how many of those grounds for fleeing have evolved and changed over the years. For better or worse is often the question. Nevertheless, it’s at a consequence that some Indians find themselves culturally deprived and economically disadvantaged compared to the transfixed success of others. So what could be the catalysis to this change within the country? Here’s where Giridharadas also assesses the cultural influences outside of, say, the caste system that once held a cord over India‘s public. Women and men of India are beginning to take control of their lives–their circumstances. And it’s complicated to do so, as the people of India give away many of their old cultural standards for something new, adventurous, and maybe even considered sinfully enticing. Giridharadas explores these changes through seven chapters where individuals he‘s spoken with, concerning the conceptualization of India Calling, share their stories. From fundamentalist, entrepreneurs, spiritual, and love-lost citizens, he categorizes his chapters between Dreams, Ambition, Pride, Anger, Love, and Freedom. And it’s here that I’m going to share quotes and pieces of each chapter to give you guys and idea as to how revealing I found India Calling. "India was changing when I arrived, and it continued to change dramatically, viscerally, improbably. The freeze I had sensed as a child seemed to be thawing. It was partly the enormous physical churn: the quantities of earth being moved, the malls and office towers and gated communities being built, the restaurants opening, the factories pumping out cars, the blue jeans being sewn. It was the new verticality of the big cities, the slum dwellers in Bombay moving into towering apartments financed by New York investors, the mushrooming of village backwaters into congested satellite cities such as Gurgaon and Navi Mumbai and Electronics City. It was the villagers who have been moved off their land so that Tata Motors, the once-stagnant company where my father worked, whose lifeless culture had pushed him toward America, could built the world's cheapest car, priced at a little more than $2,000." "You station in life was said to be determined by karma. Your position in the family was determined by your gender and birth order, not by your artistic skills or manners. Your early peer relationships in traditional households were with cousins more than friends, which meant that you didn't face the pressure that young people faced in the West to become appealing to others: you didn't have to lock down a distinctive niche on the social free market. Your marriage was organized by others, based on family reputation, not your charm. Within a clan, individual members were seen as interchangeable, as when my grandfather's family, foiled in their attempt to marry him to the woman of his choice, turned to the next daughter in the same family, my grandmother. In the corporate universe, your boss would treat your 'senior' at work (as he was invariably called) better than you simply because he was your senior, and there were few rewards for a better workplace personality, for speaking or presenting or networking in an exceptional way. Indians were, in a sense, not self-made but other-made, and the system of social incentives traditionally led people to put other pursuits ahead of standing out in the crowd." "In India, the context for moral reasoning has traditionally been one's caste or class or family circle, not the society at large, not the civic commons. Caste laws dictated how one human being was to treat another or be punished for mistreatment, not universal declarations of rights. The important question in deciding whether to extend ethical consideration to someone is 'Do they belong to our fold?'" "We are all endowed with a power to make our lives seem worthwhile to ourselves. But these faculties of transcendence and self-deception had been specially developed in India. It had been the particular gift of Indians to deny that aspect of the self that simmers resentfully, that wails in the silence of the night, 'Why me?'" "In a society like India's, the ideas of consumption and personal success had natural appeal. The old culture had been a thicket of external restraints: families had dictated whom to marry, what to study, where to work; bureaucrats had told you whether you could get a phone line or start a business; a caste had determined the amount of respect that you could command. People were now revolting against those definitions and destinies. They shared a new belief in the power of self-contained individuals: a belief that individuals must not slight elders but must no longer depend on them; must not forget their roots but must now look beyond them; must not crave a government job like their fathers but must now survive as though the state did not exist." "The Indian vision of love was, to my untrained eyes, a series of absences. It was the absence of visible affection, the absence of romantic speech, the absence of sexuality in the movies and on television. Before I understood the way to which my Indian relatives loved each other, I fixated on the ways in which they didn't. It is challenging anywhere to imagine the coming together of one's parents or uncles and aunts or grandparents. But in India it was especially difficult, for one had to imagine a universe of sentiments that seemed scarcely to exist in the physical world. They, too, were young once; they, too, felt love, even lust; they, too, knew the sadness and anxiety that come with romance–these statements were self-evident in theory, but they were hard to fathom in practice." "Indians saw Westerners as overly consumed with themselves, and they practiced a love less self-involved. They didn't require constant emotional replenishment the way Americans did. They weren't told all day long that they were loved; they didn't need to be told. Love was a quiet habit. It was knowing certain things for sure and not needing them to be repeated every day. It was the elimination of the space between two beings, not the giving of space, as in the West. Love was doled out subtly and sparingly, couched in deeds more than words, expressed in sacrifice for others and the constant involvement in each other's lives. A lover was almost like your blood: the fuel of your existence, but something that required no dwellings or philosophizing, something that simply was." "He said he wanted freedom for his children. [Implying Westerners do] 'It doesn't mean that I will supply them with drugs; it doesn't mean that I will give them some extra money to become womanizers,' he said. 'But I will allow them to find themselves on their own, find their own educational path. I was forced to do so many things: don't do this, do this. I will never let my children go through that.'" "My [the author] father favored freedom. He was an eternally patient man, almost incapable of anger with his children, no matter the crime. Only when he visited India, where he was born, did his patience dry away. When it was taking ten people ten times longer than necessary to make a decision that could be made by one person, expiration filled his eyes. When no one was straightforward about what they actually wanted to eat or where they actually wanted to go, all trying to please the others, he became frustrated. When we had to meet relatives whom we did not like but had to meet because it would 'look bad' if we didn't, I could sense him say to himself, 'Look bad to whom?'"